Boats of this shape were used across Europe for storing the incense used in church ceremonies. This silver example would have belonged to a wealthy church or abbey. The decoration of rams' heads is almost certainly a punning symbol for Ramsey Abbey. This incense boat was found in the bed of Whittlesea Mere, Huntingdonshire, when it was drained in 1850. This site is only 7 or 8 miles from Ramsey Abbey. The incense boat may have been lost in an accident, or was perhaps hidden in the mere during the Dissolution of the Monasteries. The boat has a narrow, battlemented edge and a finial at each end in the form of a ram's head (one with horn missing) rising from the sea, set on a mullet-shaped foot. The body is decorated with punched gilt strapwork; the top is engraved with two stylised double roses and one half is hinged to act as a lid, having a pointed diamond-knop. Found with the censer (M.268-1923) and a group of articles in pewter and pottery in the bed of Whittlesea Mere, Huntingdonshire, when it was drained in 1850. 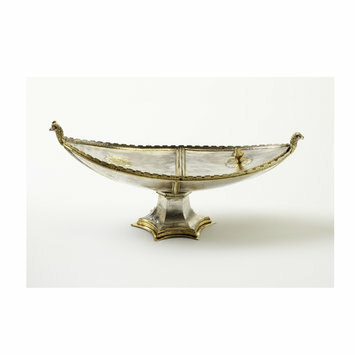 The incense boat is of the highest quality, and would have belonged to a wealthy church or abbey. The decoration of rams' heads is almost certainly a rebus (i.e. a punning symbol) for 'Ramsey'. It has therefore been assumed that censer and incense boat were once the property of the nearby Benedictine abbey of that name (7 or 8 miles away). The arms of Ramsey abbey included three rams' heads. 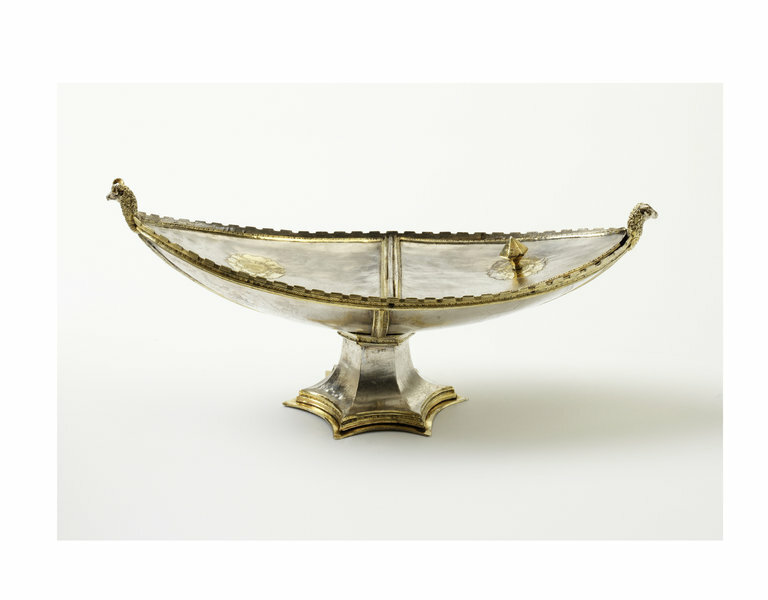 Historical significance: This is the only English example of a gothic incense boat in silver. 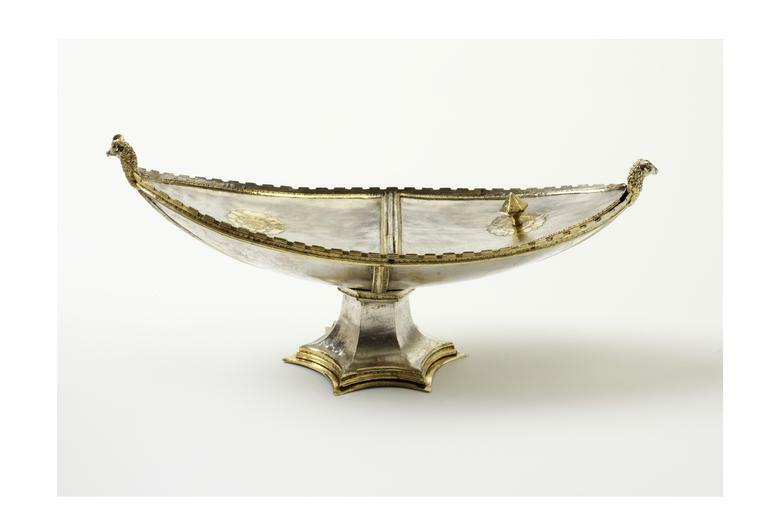 The incense boat was used to store incense for the censer, and to pour it into the censer during ceremonies. This boat form was the standard shape across Europe for such an object, and can be found in all metals, Limoges enamel examples sometimes having finials with dragons' heads. The double rose in this case is not a Tudor device, as has sometimes been suggested, but a symbol of the Virgin Mary. This was much used in the medieval period, and appears on the Grandisson ivory diptych in the British Museum of ca.1340, and on bishop William of Wykeham's crozier of ca.1367 in New College, Oxford. The provenance of this piece, the likely association with Ramsey Abbey, and the many parallels with other English artworks of this period (for example the double rose motif) make it almost certain that this is an English manufacture. The incense boat is appreciably stylistically different from the censer (for example in the handling of its crenellations), and is of slightly later date, probably around the middle of the century, when the incurving hexagonal-shaped foot was also being introduced into England for chalices.